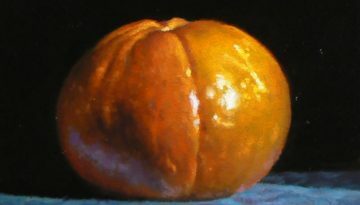 “Tangerine No. 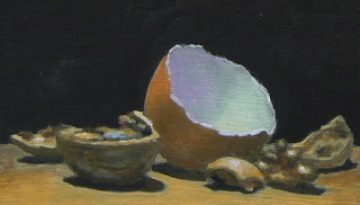 2” • Oil on Panel • 4×4 inches (10×10 cm) • 2010Private CollectionDetails page To see more paintings like this one, please click here. 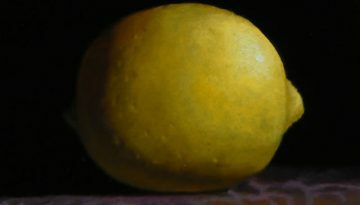 “Lemon No. 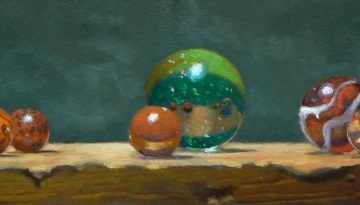 2” • Oil on Panel • 4×4 inches (10×10 cm) • 2010Private CollectionDetails page To see more paintings like this one, please click here. 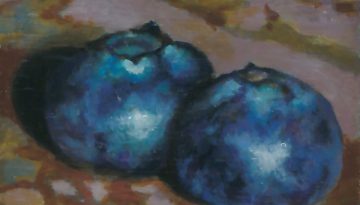 “Two Blueberries on Granite” • Oil on Wood • 2.5×2.5 inches (6×6 cm) • 2012Private CollectionDetails page To see more paintings like this one, please click here. 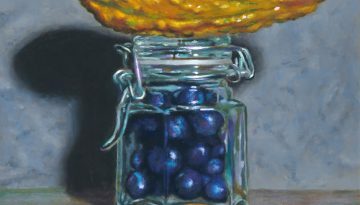 “Gourd with Jar of Blueberries” • Oil on Panel • 6×5 inches (15×12 cm) • 2012AvailableDetails page To see more paintings like this one, please click here. 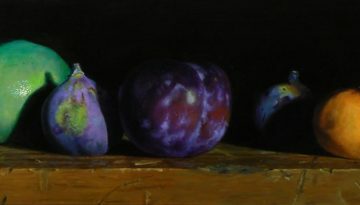 “Lime, Plum, Figs, Clementine” • Oil on Linen • 20×48 inches (50×120 cm) • 2013AvailableDetails page To see more paintings like this one, please click here. 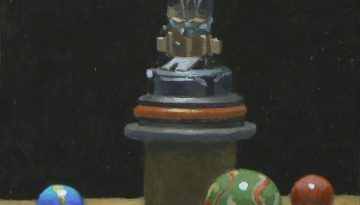 “The Oracle” • Oil on Canvas • 8×16 inches (20×40 cm) • 2013AvailableDetails page To see more paintings like this one, please click here. 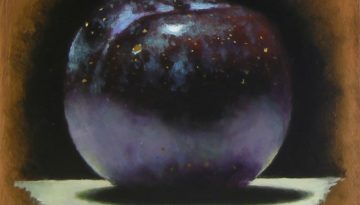 “Red Plum II” • Oil on Panel • 5×5 inches (12×12 cm) • 2013Private CollectionDetails page To see more paintings like this one, please click here. 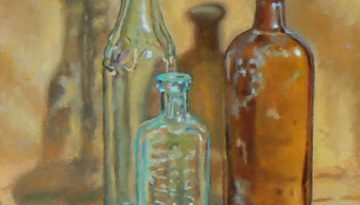 “Three Bottles” • Oil on Linen on Panel • 6×5 inches (15×12 cm) • 2008Private CollectionDetails page To see more paintings like this one, please click here. “Forum No. 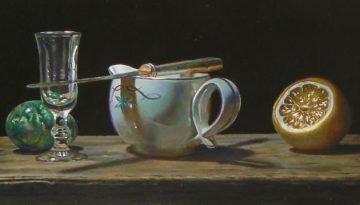 10” • Oil on Panel • 2×5 inches (5×12 cm) • 2012Private CollectionDetails page To see more paintings like this one, please click here. 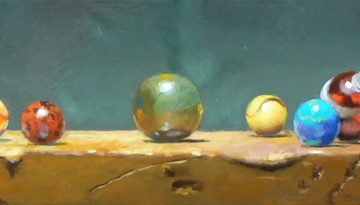 “Still Life with Green Marble Egg and Lemon” • Oil on Panel • 5×11 inches (12×27 cm) • 2009Private CollectionDetails page To see more paintings like this one, please click here. “Forum No. 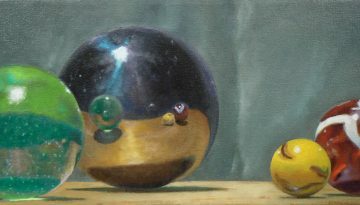 5” • Oil on Panel • 2×5 inches (5×12 cm) • 2012Private CollectionDetails page To see more paintings like this one, please click here. 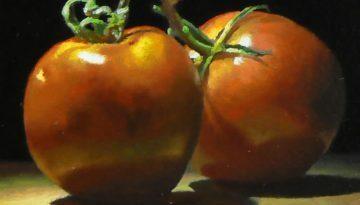 “Two on a Vine No. 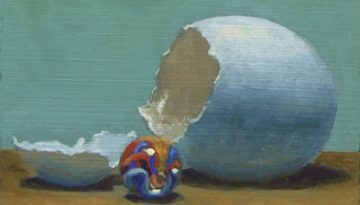 2” • Oil on Panel • 4×4 inches (10×10 cm) • 2010Private CollectionDetails page To see more paintings like this one, please click here. 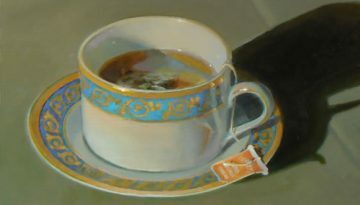 “Tea Time” • Oil on Panel • 6×5 inches (15×12 cm) • 2008Private CollectionDetails page To see more paintings like this one, please click here. 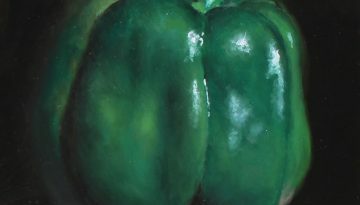 “Bell Pepper” • Oil on Panel • 5×5 inches (12×12 cm) • 2013AvailableDetails page To see more paintings like this one, please click here. 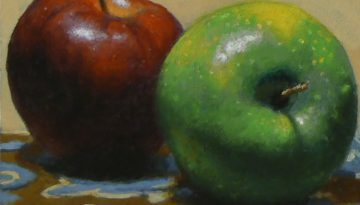 “AppleApple” • Acrylic on Panel • 4×4 inches (10×10 cm) • 2013Private CollectionDetails page To see more paintings like this one, please click here. 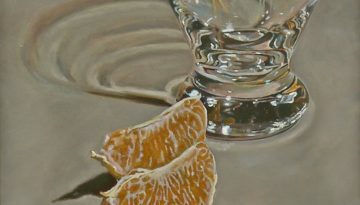 “Orange Slices and Glass” • Oil on Canvas • 30×24 inches (75×60 cm) • 2008AvailableDetails page To see more paintings like this one, please click here. 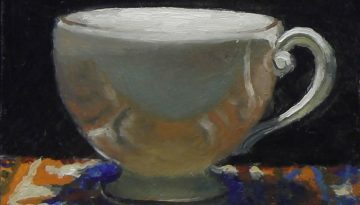 “Teacup on Oriental Rug VI” • Oil on Wood • 2.5×2.5 inches (6×6 cm) • 2013Private CollectionDetails page To see more paintings like this one, please click here.